I love your choice of a dark background for your quilt. It really makes the colors pop! Way to go, your quilt is beautiful! Love that you used your leftovers. It fun to plan a way to use the great fabrics. You made an amazing quilt with that lovely line of fabric! Your quilt is stunning....I wouldn't have thought to use the dark fabric, it really makes the bright fabrics stand out, fab-u-lous! Wow, I just love this quilt. The black really makes the great fabrics pop. I just love that you decided to use a darker background fabric for your quilt. Your decision really makes the First Blush fabrics stand out. They really look great in the Kaleidoscope pattern. I like the way that charcoal fabric turned out in the background ! It brought out the colors beautifully! Beautiful quilt! Thanks for the giveaway! The black backgroubd fabric makes the First Blush fabric stands out. Great choice. Love this quilt. Beautiful quilt! I love it with the charcoal. I really like the dark background. It makes everything pop! Ooh, I really love that quilt and yes the dark background is just right! Beautiful inspiration! Love the quilt you made with this fabric. I like that charcoal fabric with these colors. Nice job! Your quilt looks awesome! I love the scrappy look. Oooooooh my goodness!! What an AWESOME quilt!! Love the use of charcoal for background!! Definitely makes this Beautiful fabric line POP!!! Love it!! Beautiful quilt, especially with he dark background... it makes the bright colours pop!!! Beautiful. I first thought you would need to use large pieces of the fabric for it to look good, but the small pieces is your quilt are stunning. Beautiful quilt! Love your charcoal background with the bright colors. Awesome quilt. The charcoal really makes the colors of First Blush fabrics pop. Well you sure made a bright quilt! I tend not to choose dark backgrounds, but agree that the choice of charcoal makes the colors pop. 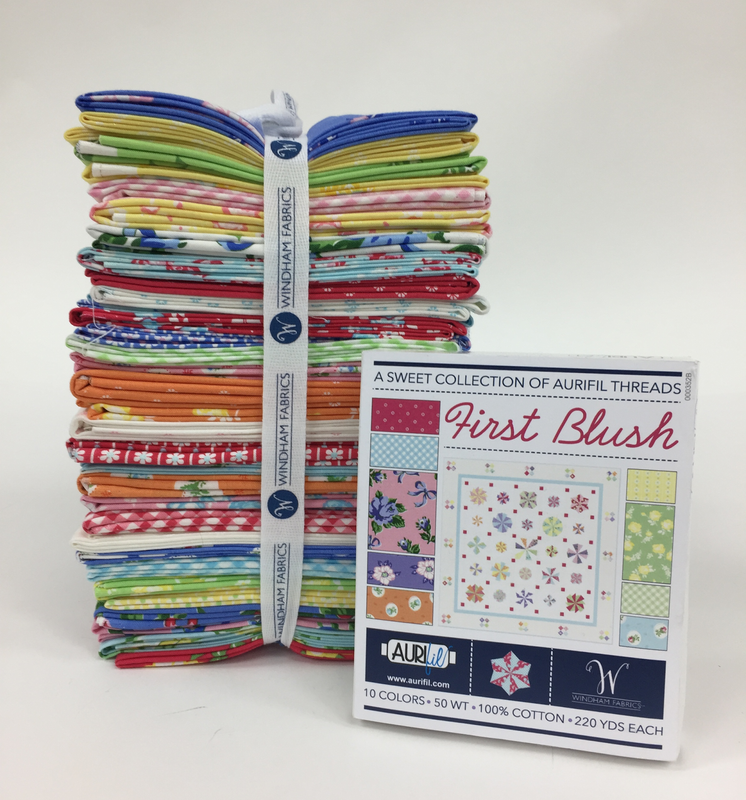 Lucky you to get Windham to send you fabrics for the blog hop. You transformed "First Blush" beautifully! I love the darker background! This is a beautiful quilt. Stunning quilt design! I'd love to make one too! Love the background fabric! It really shows off the other colors well! What a fun design! I love all these bright colours! Great work! Love the Kaleidoscope pattern! Great fabrics. That's a great quilt! Love the dark background with these sweet fabrics! Your quilt really sparkles with the dark background. Lovely! I am loving the dark backround - awesome quilt! thank you!! Thanks for sharing your joyful quilt! You are right - the background makes those wonderful colors pop! Great choice with that charcoal background. It does make those fabrics pop. Thanks for sharing. That dark background was a great choice! Lovely quilt. Awesome quilt, I just love the darker background too, and the mosaic photo is really cute! I'd love to win the fabric bundle, it would make me smile--thanks for the chance. Your quilt looks lovely. I like the black background. Leanne, you picked the perfect pattern for First Blush fabrics! I haven't seen Summer Breeze Kaleidoscope before and it makes my eyes wander all over, picking up different angles and shapes. Very cool! I like that you chose to use charcoal for the background too. So pretty! I love these fabrics. The dark background really works great. what a wonderful quilt, so glad you chose the charcoal! Wow, that looks amazing. Thanks for sharing. Like you almost did I probably would have gone with a white background but the darker background gives it a third dimensional look that the white probably wouldn't have done. I love that look in a quilt and you did a beautiful job. Your Summer Breeze Kaleidoscope quilt is outstanding! The fabric is awesome! I love your quilt. Looks great with the black contrast. Love the quilt and what you did with the leftovers! Thank you for the blog tour! Your choice of charcoal for the background was spot on! Super fun quilt! Thanks for sharing! Love that youve paired it with darker fabric. Really makes this fabric shine. Thanks for the chance to win. Wow what a wonderful kaleidoscope quilt. I've never made one before. Love it and adore the fabric! Beautiful fabrics! Love the Kaleidoscope pattern!! So beautiful!! I love the POP that the charcoal gives your patterns!! Your quilt really shows off the cheerful fabrics! The dark background changes the look so much, LOVE it. Love this fabric and your quilt. The black background is so dramatic. Perfect charcoal to complement the fresh colors! Those colours really pop on the dark background. I like it better than white. Your quilt is beautiful and what a neat collection! Your quilt is very striking with the dark background. Thank you for offering this giveaway. The vintage fabrics just pop on the charcoal! Thanks for sharing on your blog! Wow! That is a great quilt. So much color going on..love it! Thanks for sharing. Very pretty. I love the contrast you created with the black background. Love the "pop" of dark with the First Blush fabrics! Very creative; thanks for the chance! Your quilt is gorgeous! I think all of the others on the blog hop have used a white or low volume background but I really love the dark background. Beatiful quilt! The black background is stunning! Wow, the dark fabric provides such great contrast -- the colors really shine against it! I love your quilt, and the charcoal is perfect for the background. Thanks for the giveaway also. Pretty quilt, I love the dark background! I love First Blush! Can't wait to get my hands on some. I completely agree with the choice of charcoal. It just makes the colors pop! Beautiful design! Your blocks with the dark are stunning, but your prisms, that gave me the wonderful memories of a real, wooden, proper kaleidoscope I had when a child. Another fab give-away. Fabric, and matching threads, pure bliss. Daring to use the charcoal, but so right to do! Thanks for the inspiration and the chance! So far of all the quilts using this fabric line yours is my favorite. The charcoal sets off the line beaufifully. I would never have thought of useing such a dark background. Your quilt top is gorgeous! The charcoal colour really makes the bright fabrics pop! Love it! wow your quilt is stunning. What a beautiful quilt, love this pattern. I wouldn't have thought to use charcoal as the background fabric, but I must say, the end result is stunning! That is a beautiful quilt. This has been an amazing blog hop. Love your quilt! Thanks! Charcoal sure made the fabric speak to you. Gorgeous fabric . Thanks for the giveaway, love the blog hop. Very striking quilt. Thanks for sharing. The charcoal background really does "pop" the colors and gives it a whole different look. What a great pop that dark background fabric adds to your quilt. It is fun to look at. And nice leftover block too! Your choice of charcoal for the background of your kaleidoscope quilt really shows off the fabrics in the First Blush bundle. Lovely! That quilt is stunning! I'd have it as a wall hanging, it's so mesmerizing! I'm new to quilting but would love to learn how to make one like that!! The fabrics look completely different against a black background compared to the white in the other bloggers' quilts. Very pretty! Very nice quilt! Love the contrast. I agree with everyone else, your colors poop with the charcoal background. It does appear black in the photos though. I'm glad you mentioned the color, I have found black catches too much lint even in small quantities. I really like your quilt. I like the charcoal background and the secondary pattern it creates. Your Kaleidoscope quilt is very nice....I love how the colors pop against the black. I've been drawn to gray's recently....the softness of the colors in this collection would look lovely with a nice gray too! Perhaps I'll get the chance to find out! I LOVE your Kaleidoscope quilt and the dark charcoal really makes it pop! Really like this fabric group. Thanks for sharing with us in the blog hop! The kaleidoscope quilt is so pretty with a darker background. beautiful kaleidoscope and you are so right...this collection is summery to the max! The charcoal does really make a great foil for the summery and bright colors in this collection. And the kaleidoscope block makes a very cheerful and happy quilt. A very nice choice and great execution. Wow, your quilt just sings. Are you going to share what you make out of the leftovers? I know it will be special. Thanks for the chance to win. Your quilt is amazing!! Definitely breath-taking!! Just love how the background lets shine the fabrics! Beautiful quilt! Really Ike your quilt. I think the fabric colors le d themselves to lots of projects. Great fabrics and lovely quilt! What a great quilt. Love the fabric. There is a Kaleidoscope quilt in my future - bought the die so i can cut all the pieces accurately. But I haven't chosen the fabric yet. Here's hoping! Your quilt looks amazing using the dark background. Beautiful quilt! I also like the prism(?) design you were playing with! Thanks for the chance to win! Wow!! I love your quilt!!! It's the perfect way to show off those wonderful fabrics!! It's such a great range, beautiful mix of colours and the patterns are so pretty. Beautiful quilt and I love the dark background. Thanks for the generous giveaway. Beautiful! Great choice for background, it really sets it off. I love your quilt, it turned out beautiful! Beautiful quilt! The colors really do pop with the dark background, super choice! Thanks for sharing with us. I love your quilt, thanks for sharing and the giveaway! Nice; the charcoal background is quite striking. I love this pattern - your quilt is awesome! Thank you for the giveaway! Those colors and prints just pop with that grey background!